About "Area of triangle worksheet 1"
Area of triangle worksheet 1 is much useful to the students who would like to practice problems on area of triangles using the given three vertices. 2) If the area of the triangle ABC is 68 square units and the vertices are A(6, 7), B(-4, 1) and C(a, -9) taken in order, then find the value of "a". 3) Using the concept of area of triangle, show that the points A(5, -2), B(4, -1) and C(1, 2) are collinear. 4) If P(x, y) is any point on the line segment joining the points (a, 0), and (0, b), then prove that x/a + y/b = 1. where a ≠ b. Hence, are of triangle ABC is 22 square units. Let us look at the next problem on "Area of triangle worksheet 1"
If the area of the triangle ABC is 68 square units and the vertices are A(6, 7), B(-4, 1) and C(a, -9) taken in order, then find the value of "a". Hence, the value of "a" is 2. Using the concept of area of triangle, show that the points A(5, -2), B(4, -1) and C(1, 2) are collinear. 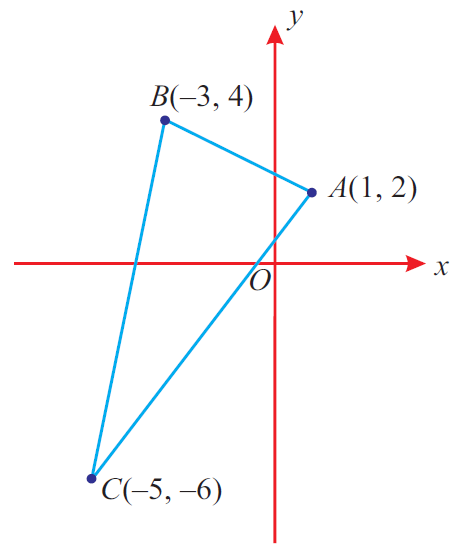 Hence, the three points A, B and C are collinear. If P(x, y) is any point on the line segment joining the points (a, 0), and (0, b), then prove that x/a + y/b = 1. where a ≠ b. Clearly, the points (x, y), (a, 0), and (0, b) are collinear. After having gone through the stuff given above, we hope that the students would have understood "Area of triangle worksheet 1". Apart from the stuff, "Area of triangle with coordinates", if you need any other stuff in math, please use our google custom search here.